Tax payers are usually cautious while filing income tax returns. But sometime due to last minute rush they might end up making mistakes. The common Income tax mistakes may cause penalty or notice. If you are about to file your income tax return, here is list of 25 common income tax mistakes you should avoid. The first common mistake you may end up doing is mentioning wrong PAN number. You should be extra careful while mentioning your PAN number in ITR. The second common mistake is a selection of wrong ITR form. Many salaried taxpayers with multiple property select ITR1 for filing return. ITR file using wrong ITR form is considered as a defective return. Next common mistake is mentioning incorrect bank account number or IFSC code. A wrong account number leads to delay in processing income tax refund. 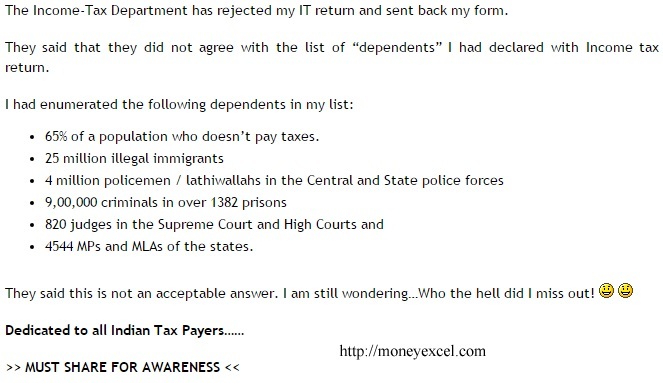 You should check 26AS form before filing Income tax return. Form 26AS is tax credit statement. This statement indicates reported income to Income tax with tax deduction amount. Most of the taxpayers make a mistake in not mentioning interest income. This may lead to under reporting of income and income tax notice. This year onwards mentioning Aadhaar Number in ITR is mandatory. You need to be careful and mention your correct Aadhaar Number in ITR. Your tax return is considered as defective in case Aadhaar Number is not mentioned. Until today, it was not mandatory to file income tax return if taxable income was below Rs 2.5 Lakh. However, from this year onwards if exempted income like long term capital gain exceeds Rs 2.5 Lakh, it is compulsory to file income tax return. So, make sure you comply with this new requirement. You should report income of your dependent (minor) under your income. Not clubbing minor income may cause under reporting of income and income tax notice. If you have changed job in a current financial year, you should make sure to report every income including income from your last job. One must report the detail of all exempted income like dividend income, income from long-term capital gain etc. There is a popular misunderstanding that these incomes need not be disclosed in ITR. However, these details are easily tracked by income tax department via your PAN card number. Make sure to mention all bank accounts in ITR. Failing to mention bank account in ITR may cause a problem related to Income tax notice or scrutiny. If you are owning second property apart from a self-occupied property, you need to report second property as let out property (irrespective of property lying vacant). You need to consider expected rent and submit the return accordingly. Another common mistake which people make after submission of ITR is not verifying return. If you are not verifying return after submission your ITR will be considered as defective. In case you find that you have done mistake in your ITR you should revise and file revise return. Not revising return in case of a mistake is a big mistake. One common misconception among tax payer is assessment year and financial year is same. You should clearly know a difference between Assessment year and the Financial year before filing ITR. Tax payer needs to file single ITR for a single financial year. You need not file multiple ITR for multiple form 16. You should provide correct e-mail address and postal address while filing Income tax return. Any information or notification sent by income tax department will be sent to address mentioned in income tax return. If you provide a wrong address you might not receive important communication from Income Tax department. The government gives you the option to either file your tax return physically or do it online. However, if your assessable income exceeds Rs 5 lakh, it becomes mandatory for you to e-file your tax return. Make sure to claim all eligible deduction under 80C. Many people make a mistake while claiming deduction under 80C. You cannot claim any exemption twice. Make sure and avoid such silly mistake while filing Income tax return. Another common misconception is one cannot file a return after a due date. However, it is not true. You can also file a return after a due date. It is mandatory to file ITR if your income is above taxable limit. It is not true that if you have paid all tax due and refund is not due you are exempted from filing ITR. If you have deposited cash above 2 Lakh during demonetization process, it is mandatory to report in ITR. Failing to report cash deposit during demonetization may lead to income tax scrutiny or notice. Making Income tax mistakes mentioned above while filing income tax return means inviting income tax department for notice, scrutiny or penalties. Avoid them to have a spotless tax record. At last, I would like to share Joke on a Rejection Income tax return. I shall consider the above points while filing the return.